Our Mpumalanga Development Co-ordinator, Jerry Mthombothi, interviewed Elias Pangane for this issue of Pula Imvula. Elias farms between Mkhuhlu and Hazyview on 50 hectares of arable land and would like to become a commercial farmer in the next five years. I farm on 50 hectares arable land at Mashobane Boerdery (Loss and Found Farm) between Mkhuhlu (Bushbuckridge) and Hazyview. I currently farm with 4 hectares green mealies, 2 hectares green beans, 2 hectares butternuts, 1 hectare tomatoes and 40 hectares Macadamia nuts. I enjoy farming as a hobby but also farm to create job opportunities. I grew up helping my father who was a small scale farmer. The income I generate from farming also motivates me. Strengths: My strengths are that I have knowledge of farming. I receive good support from various organisations like Grain SA, Bayer, Hygrotech and Sabie Valley Macadamia Processing. I own the following farming implements: Three tractors, one Landini, one farm track and Fiat 6555, one disc plough, one disc harrow, one rotavator, one boom sprayer and one planter. I also do construction jobs and own a TLB, four trucks and six bakkies. I have 136 cattle: Four are bulls, 100 are cows and 32 are heifers who graze on 5 000 ha communal land. I employ 25 permanent workers and dedicated management staff. I have a readily available market for my green mealies and vegetables from Veg Fresh Mark. For the marketing of the Macadamia nuts, I make use of Sabie Valley Macadamia Processing. Weaknesses: I have stock theft problems and another problem is that I can’t sell my livestock because I’m situated next to the Kruger National Park and my area was declared a “red line” area because of the foot and mouth disease. The area where I am situated is a low rainfall area (we received ±350 mm per annum) and at times we have drought. Another challenge is the minimum wage issue – we need to pay our labourers under the difficult situations which we are facing. When I started farming with maize under irrigation, I used to yield ±3 tons/ha but now I’m yielding between 6 tons/ha and 7 tons/ha. With tomatoes I used to yield less than 10 tons/ha, now I yield between 25 tons/ha and 30 tons/ha. 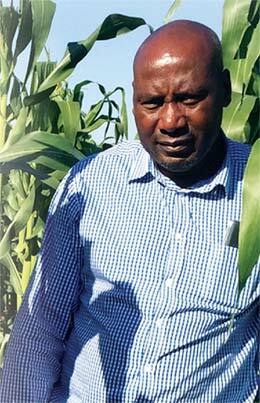 With butternuts I used to yield less than 4 tons/ha and now I yield between 13 tons/ha and 15 tons/ha. The main contributor to my success was the training I received from the various institutions like Grain SA, Bayer, Hygrotech, DARDLA and Omnia. These institutions send their representatives to visit us on a regular basis to give us advice and support. I have attended workshops, Farmers’ Days and other courses organised by the Department of Agriculture, Grain SA and Sabie Valley Macadamia. I still require training on tractor and implement maintenance as well as vegetable production. Where do you see yourself in five year’s time? What would you like to achieve? I want to become a big commercial farmer and employ more workers to reduce the unemployment rate in our area. I want to process more products on my farm and sell processed products. They must be patient, any business needs patience. They must work hard and dedicate their time to whatever they are doing. They must be hands on and not rely on other people to do the job for them. Article submitted by Jerry Mthombothi, Development Co-ordinator of the Grain SA Farmer Development Programme.